Today is the Day of Atonement or Yom Kippur. It is the holiest day of our calendar, along with the symbolism of the Lord's Supper. This year is a particularly important anniversary and marks an important phase in the steps toward the Return of the Messiah. It is 40 years since the Yom Kippur War of 1973. Forty years is the period allocated for repentance. The following is a recognised historical record of the war from the Jewish Virtual Library (http://www.jewishvirtuallibrary.org/jsource/History/73_War.html ). "On October 6, 1973 — Yom Kippur, the holiest day in the Jewish calendar (and during the Muslim holy month of Ramadan) — Egypt and Syria launched a coordinated surprise attack against Israel. The equivalent of the total forces of NATO in Europe was mobilized on Israel's borders. On the Golan Heights, approximately 180 Israeli tanks faced an onslaught of 1,400 Syrian tanks. Along the Suez Canal, fewer than 500 Israeli defenders with only 3 tanks were attacked by 600,000 Egyptian soldiers, backed by 2,000 tanks and 550 aircraft. At least nine Arab states, including four non–Middle Eastern nations (Libya, Sudan, Algeria, and Morocco), actively aided the Egyptian-Syrian war effort. A few months before the attack, Iraq transferred a squadron of Hunter jets to Egypt. During the war, an Iraqi division of some 18,000 men and several hundred tanks was deployed in the central Golan and participated in the October 16 attack against Israeli positions. Iraqi MiGs began operating over the Golan Heights as early as October 8 — the third day of the war. Besides serving as financial underwriters, Saudi Arabia and Kuwait committed men to battle. A Saudi brigade of approximately 3,000 troops was dispatched to Syria, where it participated in fighting along the approaches to Damascus. Also violating Paris's ban on the transfer of French-made weapons, Libya sent Mirage fighters to Egypt. Other North African countries responded to Arab and Soviet calls to aid the front-line states. Algeria sent three aircraft squadrons of fighters and bombers, an armored brigade, and 150 tanks. Approximately 1,000 to 2,000 Tunisian soldiers were positioned in the Nile Delta. Sudan stationed 3,500 troops in southern Egypt, and Morocco sent three brigades to the front lines, including 2,500 men to Syria. Jordan's King Hussein, who apparently hadn't been informed of Egyptian and Syrian war plans, chose not to fight this round, correctly calculating that his forces were vastly inferior to the Israelis'. Hussein's decision was crucial to Israel's defense because it freed up forces that would otherwise have had to fight on a third front. Still, Arab brotherhood required that Hussein contribute to the cause, so he sent two of his best units to Syria. Three Jordanian artillery batteries also participated in the assault, carried out by nearly 100 tanks. During the October war, the Arab oil-producing states imposed an embargo on oil exports to the United States, Portugal, and Holland because of their support for Israel. The impact was to cause a shortage of petroleum in the United States and a quadrupling of gas prices. Americans soon had to contend with long lines at gas stations. Several U.S. oil companies that got most of their petroleum supplies from the Middle East, and depended on the goodwill of the Arab states to maintain their business relations in the region collaborated, in the embargo against their own nation. Oil company executives lobbied the Nixon administration to offer more support to the Arabs and less to Israel. They, along with state department Arabists, hoped to convince the public that Israel was to blame for the United States's (sic) economic hardships and that it was far more important for the United States to ally itself with the Arab states than with Israel. The oil embargo was lifted in March 1974, but the United States and other Western nations continued to feel its effects for years to come. Thrown onto the defensive during the first two days of fighting, Israel mobilized its reserves and began to counterattack. In the south, Israeli forces were having little success in stopping the Egyptian onslaught. Still, the Sinai Desert offered a large buffer zone between the fighting and the heart of Israel. The situation was different in the north, where the Syrians had swept across the Golan and could, in short order, threaten Israel's population centers. 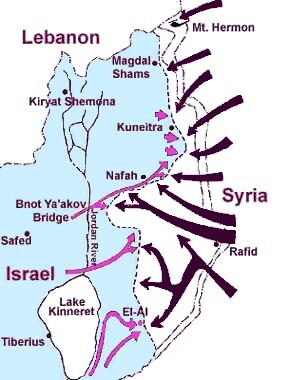 Consequently, most reserves meant for the Egyptian front were shifted to the Golan. The replenished Israeli forces stopped the Syrian advance, forced a retreat, and began their own march forward toward Damascus." The Soviets gave their wholehearted political support to the Arab invasion. Starting as early as October 9, they also began a massive airlift of weapons, which ultimately total[l]ed 8,000 tons of materiel. The United States had given Israel some ammunition and spare parts, but it resisted Israeli requests for greater assistance. As the Soviets continued to pour weapons into the region, Kissinger decided that the United States could not afford to allow the Soviet Union's allies to win the war. The secretary of state wanted to show the Arabs they could never defeat Israel with the backing of the Soviets. He also couldn't afford to let U.S. adversaries win a victory over a U.S. ally. By sending arms to Israel, the United States could ensure an Israeli victory, hand the Soviets a defeat, and provide Washington with the leverage to influence a postwar settlement. On October 12, Nixon ordered an emergency airlift to Israel. Cargo planes carrying spare parts, tanks, bombs, and helicopters flew round-the-clock to Israel. The resupply efforts were hampered by America's NATO allies who, capitulating to Arab threats, refused to allow American planes to use their air space. The one exception was Portugal, which as a consequence became the base for the operation. Between October 14 and November 14, 1973, 22,000 tons of equipment were transported to Israel by air and sea. The airlift alone involved 566 flights. To pay for this infusion of weapons, Nixon asked Congress for and received $2.2 billion in emergency aid for Israel. In the greatest tank battle since the Germans and Russians fought at Kursk in World War II, roughly 1,000 Israeli and Egyptian tanks massed in the western Sinai from October 12 through 14. On October 14, Israeli forces destroyed 250 Egyptian tanks in the first 2 hours of fighting. By late afternoon, the Israeli forces had routed the enemy. Meanwhile, Israeli General Ariel Sharon had been chomping at the bit to cross the Suez Canal but had been ordered not to do so until after the main Egyptian force had been defeated in the Sinai. With that mission accomplished, Israeli paratroopers snuck across the canal and established a bridgehead. By October 18, Israeli forces were marching with little opposition toward Cairo. For the Israelis, the crossing was a great psychological boost; for the Egyptians, it was a humiliation. About the same time, Israeli troops were on the outskirts of Damascus, easily within artillery range of the Syrian capital. Prime Minister Meir did not want to attack Damascus, so the IDF stopped its advance and focused its activities on recapturing Mount Hermon — the highest peak in the region and a key Israeli radar and observation post that had fallen to the Syrians early in the fighting. On October 22, Israel once again controlled the Golan Heights. Meanwhile, the air battles were one-sided. Israel lost 114 planes during the war — only 20 in aerial combat. Israeli pilots shot down at least 450 Arab aircraft in dogfights. As Israeli troops began to advance on Damascus, the Soviets started to panic. On October 12, the Soviet ambassador informed Kissinger that his government was placing troops on alert to defend Damascus. The situation grew even more tense over the next two weeks, as Israeli forces reversed the initial Egyptian gains in the Sinai and began to threaten Cairo. The Egyptian Third Army was surrounded, and Israel would not allow the Red Cross to bring in supplies. At this point, Sadat began to seek Soviet help in pressing Israel to accept a cease-fire. On October 24, the Soviets threatened to intervene in the fighting. The U.S. Central Intelligence Agency (CIA) reported that the Soviet airlift to Egypt had stopped and that it was possible the planes were being prepared to change the cargo from weapons to troops. Responding to the Soviet threat, Nixon put the U.S. military on alert, increasing its readiness for the deployment of conventional and nuclear forces. The United States was in the midst of the political upheaval of the Watergate scandal, and some people believed Nixon was trying to divert attention from his political problems at home, but the danger of a U.S.–Soviet conflict was real. In fact, this was probably the closest the superpowers ever came to a nuclear war other than the 1962 Cuban Missile Crisis. Fortunately, the Soviets backed down and never sent troops to fight. The Soviet Union showed no interest in initiating peacemaking efforts, so long as it looked like the Arabs might win. The same was true for UN secretary-general Kurt Waldheim. After the situation on the battlefield changed in Israel's favor, however, desperate calls were made for the fighting to end. On October 22, the UN Security Council adopted Resolution 338 calling for "all parties to the present fighting to cease all firing and terminate all military activity immediately." The resolution also called for the implementation of Resolution 242. The vote came on the day that Israeli forces cut off and isolated the Egyptian Third Army and were in a position to destroy it. Israel reluctantly complied with the cease-fire, largely because of U.S. pressure, but also because the next military moves would have been to attack the two Arab capitals, something few believed would be politically wise. By the end of the fighting, 2,688 Israeli soldiers had been killed. Combat deaths for Egypt and Syria total[l]ed 7,700 and 3,500, respectively. Ironically, the United States had helped save Israel by its resupply effort[md]and then rescued Egypt by forcing Israel to accept the cease-fire. Henry Kissinger had used U.S. power and diplomacy to try to bring about a war result that would allow Egyptians to erase the stain of 1967 without allowing them to win or Israel to humiliate them again. In January 1974, Israel and Egypt negotiated a disengagement agreement (Sinai I) thanks to Kissinger's shuttle diplomacy — so named because he flew back and forth between the two countries with American suggestions, as well as offers and counteroffers from the two governments. The Sinai I accord allowed the Egyptians to retain control of the Suez Canal, freed the Third Army, and drew a cease-fire line on the east side of the canal, with a buffer zone between the two forces. A second disengagement agreement (Sinai II) was signed in September 1975, which called for the withdrawal of Israeli forces from two strategic passes in the Sinai and some surrounding territory. The Egyptians were not allowed back into this neutral zone. Instead, U.S. peacekeepers were deployed to monitor the area. The negotiations with the Syrians were more tortuous. It was not until May 1974 that a separation of forces agreement was signed that created a UN–policed buffer zone, a reduction in troop deployment, and the return of the town of Kuneitra to Syria. And that came only after a renewal of fighting in March. Syria fired artillery at Israeli positions between March and May, during which 37 more Israeli soldiers were killed. The United States rewarded Syria for the agreement with a modest grant of financial assistance[md]the first in 30 years — in hopes of building a new relationship with the regime of Hafez Assad and encouraging him to negotiate a peace agreement. As Nixon's successors would also discover, Assad was happy to take whatever the United States was willing to offer, but he gave nothing in return. Rather than join the peace process, Assad became one of the leaders of the Rejectionist Front. Assad was also determined to impede Israeli-Egyptian negotiations. He feared that an agreement between them would reduce Egypt's willingness to fight for the Arab cause and that Sadat would accept a separate deal with Israel that would not address Syrian grievances." The aftermath of this saw Golda Meir resign from political office due to her role in the initial failures as well as Moshe Dayan whose career was now in tatters. Hafez Assad was replaced by his son Bashar Al Assad. They strengthened their armed forces with newer Russian weaponry and biochemical agents in over 50 locations in Syria. The current collapse in Syria is a sectarian conflict between Sunni majority with terrorist elements assisting them and Shia/Allowite minorities and Christians battling to survive the Islamist terrorists with many forced to support the regime even though they are opposed to it and its methods. Russia and China are using their positions on the UN Security council to veto and UN actions in Syria. A recent ploy to forestall US military strikes in Syria has seen Russia attempt to persuade Syria to hand over its chemical weapons to the UN inspectors and have them destroyed. The end result will be to see the Regime use this ploy to allow the relocation of the chemical weapons to Islamist elements for use against the West. The war will become disbursed. Given the current division between Sunni and Shia effectively divorcing cooperation between Egypt and the other Sunni states and the Russian/Shia alliance between Russia, Iran, Syria and potentially Lebanon, only a direct attack on Israel by these Shia states will unite Islamic states. The failure of the US in Iraq has seen the political position of the US drop and Obama is now faced with the legacy of Bush and Blair in the UK and Howard in Australia. The Congress is facing a serious problem and Obama has now asked congress to delay their vote until after this latest ploy unfolds re the Syrian weapons destruction. Syria is buying time and will only agree as far as it suits their political purposes. Great Britain voted against PM Cameron in a military strike and were amazed to find out that the UK had supplied the chemical to make the Sarin Gas agents in Syria not 11 months previously. France has resolved to assist the US in its military strike but will now wait on the Congress vote. So, Israel is now faced, 40 years later, with a far messier situation and the world is once again on the brink of biochemical and nuclear war. The Bible refers to these wars as the wars of the Fifth and the Sixth Trumpets. The destruction or limitation of these bio-chemical agents is only a temporary measure and it is beyond doubt theologically that the Middle East will provoke these wars and that the power in the Euphrates basin will be incited by the four demons given power over them at this end time to precipitate the wars in immediate succession. These two wars will involve Europe and Asia and the Pacific powers with Africa in train (see the paper War of Hamon-Gog (No. 294)). Has Israel repented of its heresy and falsehood? The answer is no. It is still using the Talmud to turn the Bible on its head. It is still operating its financial systems contrary to Bible Law. It is still running its religious systems according to the Babylonian Calendar and its intercalation which run contrary to the cycles of the heavens and according to the postponements introduced under the High Priest Hillel II in 358 CE some 328 years after the death of Christ and 278 years after God destroyed their Temple system and sent them into captivity in 70 CE at the end of the prophesied 70 weeks of years (see the papers The Sign of Jonah and the History of the Reconstruction of the Temple (No. 13) and War with Rome and the Fall of the Temple (No. 298)). They are now about to be brought to Repentance in the process of the last days which is symbolised by the Day of Atonement in the Bible Calendar. The significance of Atonement is explained in the papers Atonement (No. 138) and Azazel and Atonement (No. 214 ). Israel will be brought to repentance and will turn to be saved by Messiah at his return. That process will occur in the 1260 days over the preaching of the Witnesses on the Temple Mount in Israel (see the paper The Witnesses (including the Two Witnesses) (No. 135)). In this period the entire world will be brought to repentance. Islam is still unrepentant following a false calendar and destroying the teachings of the Koran and ignoring the Laws of God as given to the patriarchs and to Moses and the elders of Israel. They distort the faith with the lies of the Hadith and the traditions of pagans. They mutilate their women and treat them like dogs. They revel in ignorance and brutality. They kill innocent men, women and children. Their violence is unabated and they are unrepentant and false sworn at the end of this 40 years allocated to them to repent. God is about to bring the final wars of the end upon them and He will bring them to the Messiah and to repentance with fire and sword and with diseases and pestilence. The Middle East will not rest now until Shiloh comes and then only after their repentance and inclusion in the plan of God. Firstly Elijah and Enoch will come to them and restore the Laws of God among them and the calendar and the proper system of worship, or they will die. Everyone that bothers themselves with Jerusalem will die. Gaza and Lebanon and Syria will face war and occupation and the NATO powers will come against Russia and China. Then they will return to Jerusalem and occupy Gaza and Jerusalem and Lebanon and Syria for 42 months. Only Jordan will escape out of their hands. They will control all of Egypt and also from Libya to the Atlantic and from Suez to the mountains of Ethiopia and to Somalia. They will have destroyed all of the powers of the Middle East to Russia prior to that period. Then they will face the Messiah. Their religious systems will be thrown down and their governments and administrations will also be destroyed and they will be brought to repentance. Then the whole world will send their representatives to Jerusalem each year at Atonement and they will celebrate Tabernacles and be instructed in their obligations of the coming year from year to year (Zech 14:16-19). If they do not keep the Laws of God and His sacred calendar they will die (cf. also Isa. 66:23). The wars will now escalate over the period 2013-2024. In 2025 God has promised the treble harvest of the sixth year of the Seventh Cycle prior to the Jubilee of the Seventh Sabbath at Atonement on to the Atonement of the Jubilee year in 2027. In 2027 from the Last Great Day in the Seventh Month all lands will be allocated according to the plan of God for the 1000 years of the Millennium which will begin its first sacred year from the New Moon of Abib 2028. That is Scripture and Scripture cannot be broken (Jn. 10:34-36).